Spaces for Life: How do we want our homes to change us? It seems that when we feel threatened, we tend to push people away instead of pulling them close. We often put up defenses instead of reaching out to connect. It’s natural to respond this way. Closing our eyes when we are about to be hit protects our eyes from getting hurt. But it also prevents us from seeing clearly. It is hard to avoid conversations about the Orlando shooting and the incredibly divisive presidential elections. I made the mistake of stumbling onto some Facebook conversations and reading some articles that were so blindly reactionary it just made me sad. The shooting is tragic, but then parts of our reaction to it has been tragic as well. I think one of the biggest mistakes we can make when we feel threatened is to react without truly understanding. Being a contractor, I wonder how our homes might help us or hurt us in this process. That may seem like a strange question to ask right now, but that is the lens I see the world through. 1. We humans are creatures that thrive in nurturing connections with others. 2. The spaces we live in help to shape us into more connected, or sadly, less connected creatures. So, you may ask (if you haven’t skipped this column for another juicy article about what’s wrong with Donald Trump or what’s wrong with immigration or what’s wrong with…) how could my home possibly help me to be a person who can feel less threatened and to connect better with others? These are the deep down core desires of most of us, but they aren’t the things we talk about wanting, and often, they aren’t the desires we end up fulfilling. What if they were? 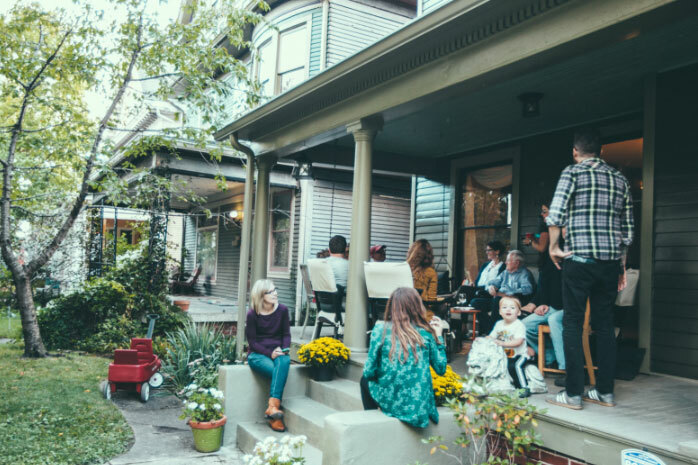 What if we designed our homes to help us be more intimately and openly connected with others? What would that look like? There aren’t 5 easy steps, but there are some common elements. It would have a family room that is the right size for a good conversation. Too big and it’s hard to talk easily, too small and you don’t feel comfortable. It would have space outside that also encourages connection. Front porches that invite neighbors up and some comfortable space in the back yard that encourage people to relax. The rooms would all have good connection from the indoors to the outdoors. This actually helps us feel more at peace. So, I know this won’t magically bring about world peace. That feels so far away sometimes. But it may help bring peace in our own little world. Posted by retouchco Categories: Home Tips, HVAC, Uncategorized No comments yet. Staying cool? I didn’t think so. It is so hot that even my conservative friends are starting to reconsider global warming! This week I wanted to talk about the most important part of your house right now: your air conditioner. Don’t think it is the most important? Try turning it off. Yeah, I didn’t think so. Posted by retouchco Categories: Home Tips, Uncategorized No comments yet. That question has killed many a beautiful dream. But it doesn’t have to. Here are some of the best options for paying for that project. Posted by retouchco Categories: Design Services, Fairway Remodeling, Home Additions, Home Tips, Kitchen Remodeling, ReTouch Interiors, Uncategorized No comments yet. When you are getting ready for a project, the most important decision you will make is in picking the team. The contractor, architect and interior designer will be crucial to getting you the space you want. I’ve talked a lot about how to pick the contractor, but I wanted to share some thoughts on how to choose the interior designer. I’ve worked with dozens of designers over the years, and some of those experiences have been incredible while some make a project even more challenging for everyone involved. Here are some of the things I’ve learned. One of the big questions in any remodeling project is where to get the materials. Do we get the tile from one of the tile stores in town? Do we order our lights online? Should we save some money by buying our cabinets at Home Depot? There are so many opinions, I might as well share mine. Lawyer’s disclaimer: I am a big advocate of buying local any time you can. Also, keep in mind I’m over simplifying a complicated issue here. There are exceptions to every rule. Take your time on purchases and rely on expert advice any time you can.